Hint: This photo is from the marvelous Detroit Public Library digital collection. What is the location and orientation of this photo? Provide a rationale. The Westbury Road Motor Parkway Bridge in East Meadow was one of the 16 bridges opened on October 10, 1908 for the Motor Parkway Sweepstakes and opening of the parkway. The view is looking south-east. 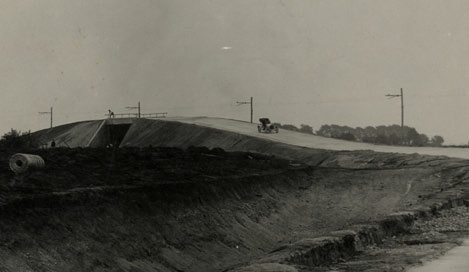 It is the only one of the 16 bridges built on a curve in the Hempstead Plains with no buildings in sight. The telephone/telegraph poles along the Central Railroad provided another clue. What month and date was this photo taken? Provide a rationale. 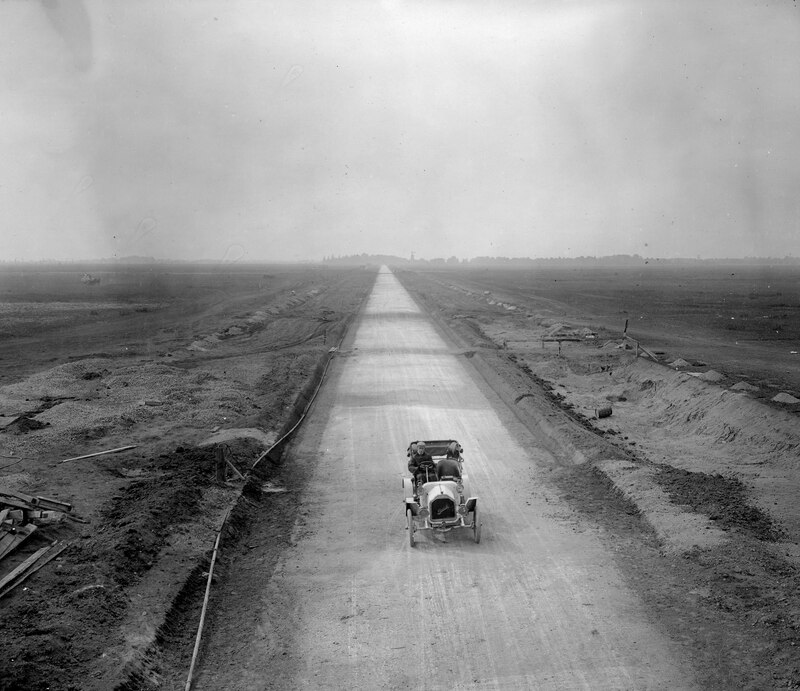 This photograph was part of a series of photos taken by photographers Spooner & Wells in September 1908, one month prior to the opening of the Motor Parkway. The photographer's assistant was sitting in a Buick to provide perspective to the photos. Oher clues were the construction barrels on both sides of the parkway and the absence of guardrails. Moreover, the Detroit Public Library also dated the photo to "Roads1908". Congrats and kudos to Frank Mendyk, Ariejan Bos, Greg O., and Steve Lucas for identifying the Westbury Road bridge and the September 1908 date. Update 6/29/2017: Frank Femenias conducted an analysis of the southern view from the Central Avenue/LIRR Bridge. Another Lazarnick photo on the Westbury Road Bridge. Carmen Avenue Bridge in East Meadow. The photo was on the cover of the book Long Island Motor Parkway. Central Avenue/LIRR Bridge in Bethpage looking south. Frank Femenias: Fantastic top view of the bridge! What stands out most is the low railroad type railing on both sides. Wouldn't want to be involved in an auto accident up there! Glad to hear there were no reported incidents while still in operation. My zooming capabilities are limited but I may see Foran's hot dog stand in the center circle. Hoping anything can be exposed more clearly. Keeping my fingers crossed! Central Avenue/LIRR Bridge in Bethpage looking north. note the Nibbe Cemetery on the left. At Round Swamp Road looking east with the Bethpage Lodge under construction. Bloomindale Rd. Coming from the NW, heading South then East. 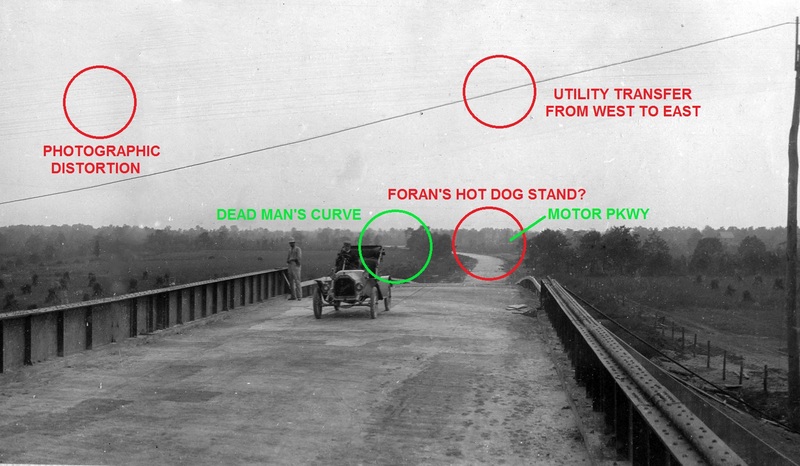 I suspect the picture in 1908, as the car on the bridge looks like the official photographer’s car. The bend, the lack of trees and the power lines were all usable clues. The photo was taken looking east along the parkway just before the Westbury Rd parkway bridge (bridge #38}. You can observe the LIRR Central branch telegraph/block poles on the right side of the photo. The photo was taken in September of 1908 as per the photo posted in the LIMP Bridge series. You can observe the same Buick going over the bridge. The telegraph poles can also be seen in the completed bridge/ construction photo of August 20,1908. Let’s see if it’s the Newbridge Road Bridge in today’s Levittown. Curved bridge, telegraph poles. View looking west (car going east). 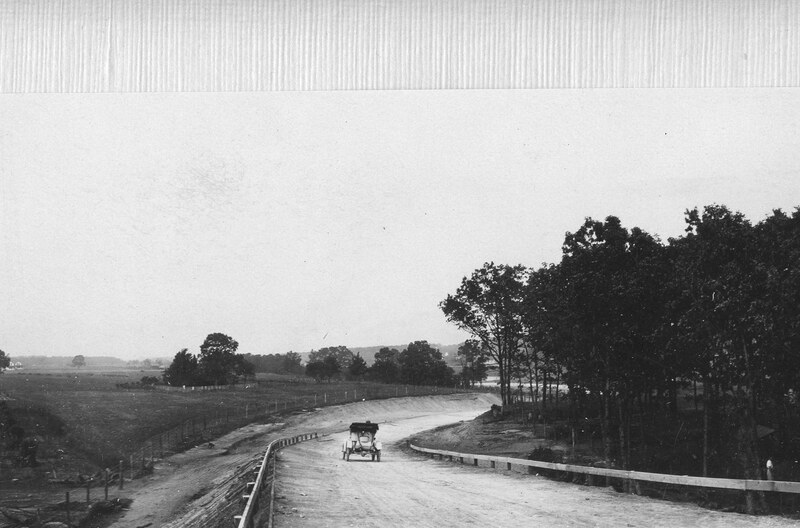 September, 1908 - road is finished by guard rails not in place for the Vanderbilt Cup Race. I suspect that is in Bethpage over the LIRR tracks and Central Ave. The camera is looking south/southwest, in a location about where the 135 now runs. 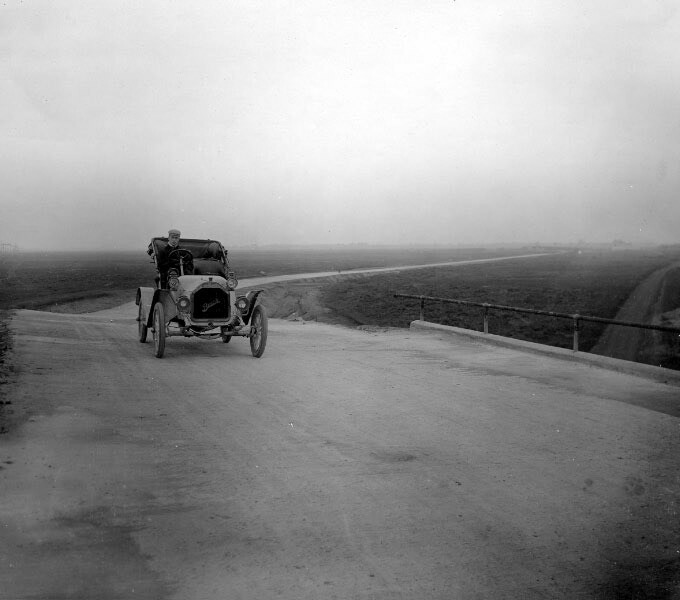 Looks like the view westbound east of the Plainview Road bridge in Bethpage in 1908. The remains of water pumping stations on the roadsides. The bridge is the Westbury Road bridge, the direction of the photo is south-east. Behind the bridge the telegraph poles along the Long Island Railroad are visible. 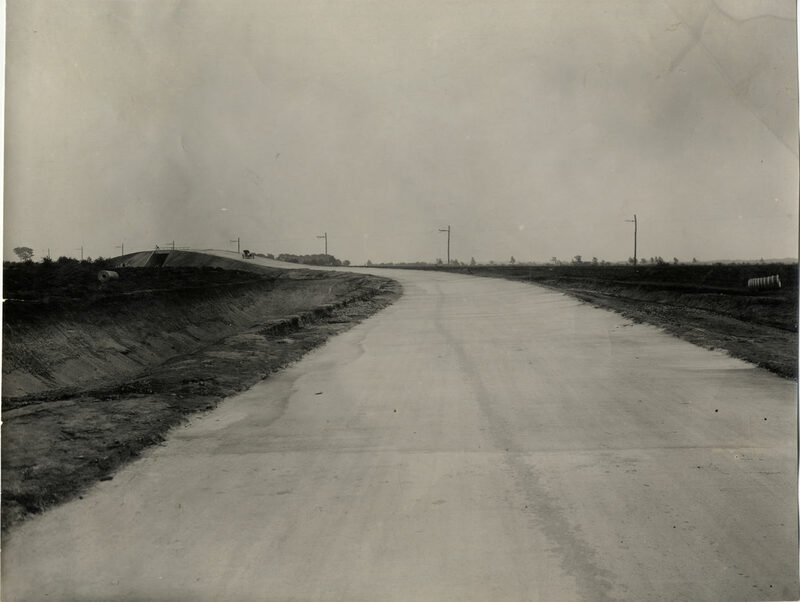 The photo is one of a series of photos of the almost finished Motor Parkway, dating from September 1908. The car in the distance is the photographer’s Buick, featuring in several other photos of this series. Of these at least one was photographed on the same bridge in the opposite direction shortly before or after the mystery photo: on both photos you can see the same piece of sewer pipe on the west side of the road. Bridge after a left curve along the Central RR looking East South/East- I’ll guess the Westbury Ave parkway bridge. 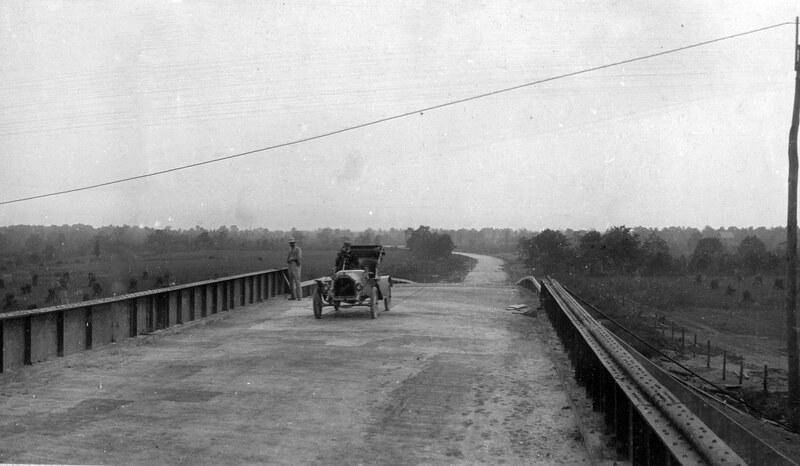 That looks to be the same photographer and assistant in their Buick from other bridge photos dating this as September 1908 just after LIMP completion. Correcting myself- Westbury Road (not Ave) bridge is Westbury. Not 100% sure but I think we’re looking southeast just before the LIMP turns east and goes over (Old) Westbury Road. Those telephone poles in the background are probably running next to the Central Branch of the LIRR. 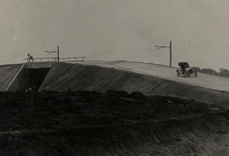 Photo was probably taken in September, 1908 since the LIMP is not quite finished yet (no guardrails). Also, it looks like the photographer’s Buick in the background and he took several other photos along this stretch of LIMP at the same time. There are two bridges that fit the foto; Little East Neck Rd bridge looking westbound, and Old Westbury Rd bridge looking eastbound. My first guess was incorrect. Good luck everyone. Great mystery foto find, Frank! Like the image of the Central Ave/LIRR overpass. Looks to be quite a drop from the bridge to the roadway. Appreciate the photo looking north towards Deadmans Curve#2. Frank and I found the concrete post on the E/S of the LIMP here before the curve. Of course this image displays the original cedar boundary posts. The tallest tree in the cemetery I believe is still standing. When Frank and I were visiting there, there’s a huge wide spreading type of maple tree pretty much in the middle. It’s unfortunately showing signs of wear. It’s as close as you can get.